The MtGox exchange has been both a blessing and a bane for Bitcoin since it switched from a being a trading-card business ("Magic The Gathering Online eXchange") to becoming the world's first Bitcoin exchange. In the early days, it was the only way for many around the world to buy Bitcoins. As Bitcoin grew, MtGox became more of a headache, plagued with technical problems and mismanagement, and less-than-forthcoming to the public about its various misadventures. By the middle of 2013, many Bitcoin players had migrated to newer and more reliable exchanges (such as BTCE, BitStamp, CampBX, etc.). Nevertheless, until this week MtGox retained a significant market share of Bitcoin traffic: problems at MtGox would pummel the Bitcoin price for everyone. This is a chart for the day MtGox came online (time not available). Pallas/Ethics: Pallas is parallel the Sun, but trine South Node and sextile Pluto which is conjunct the North Node. This suggests probably solid ethics in infancy, but increasingly more corrupt with time. Venus/Economics: A mixed picture with Venus trine the North Node (positive/capitalist) but widely opposite Neptune and ruled by Mercury which is quindecile Neptune. The Neptune/Venus connections along with the debilitated Pallas suggest the potential for theft. This aforementioned quindecile between Neptune and Mercury, the aforementioned debilitated Pallas, and Neptune quincunx the Sun suggest a capacity for shadiness and deception. Again, not so much in the early days of the entity but increasingly with time. Here is the same chart, with transits for the most recent outage (which many consider to be the death-rattle for the exchange). Jupiter-Uranus-Pluto T-square directly across the MtGox nodal axis. Bad publicity (Jupiter on the SN), disruption (Uranus), and death (Pluto on the NN) in a way that has permanent karmic repercussions (the nodal axis in general). Transiting South Node is quincunx MtGox Saturn: a loss of authority/structure. 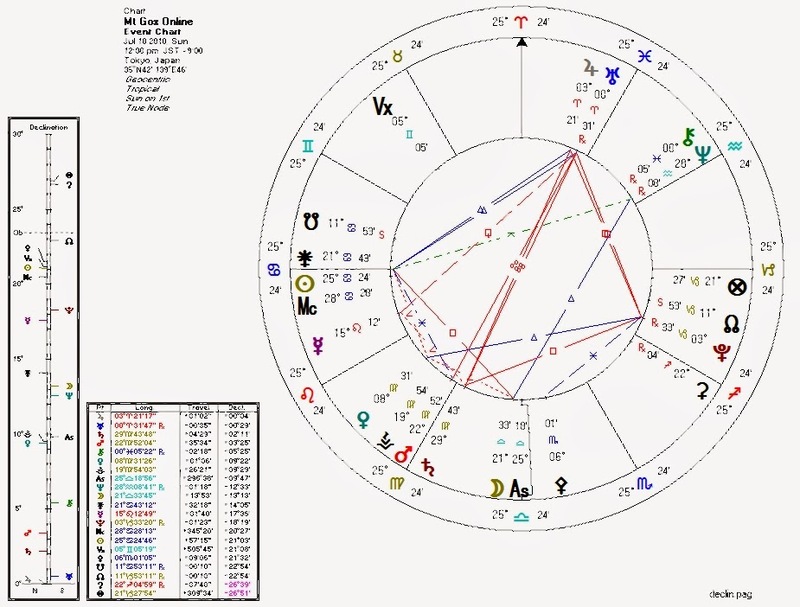 Transiting Pallas is quincunx MtGox Jupiter (ethics made public) and trine the MtGox Pluto (some ethical considerations regarding power/money/death?). 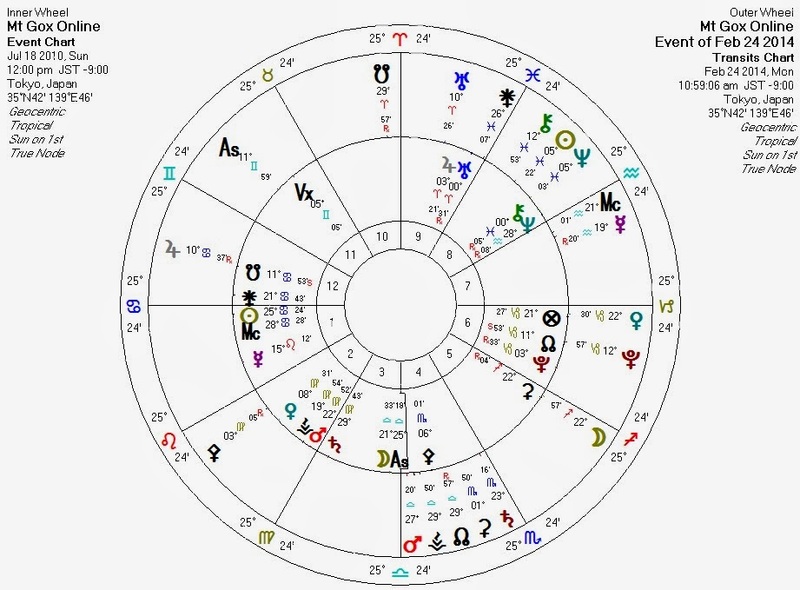 Transiting Mercury is quincunx MtGox Vesta (news regarding investments?). Mercury is now conjunct the Bitcoin Chiron (a point which always seems to indicate a price drop). Transiting Moon is conjunct MtGox Ceres. Ceres is still a mysterious body, but we've seen another chart involving a sudden shocking loss in which the Moon and Ceres are together. Should MtGox die or fade into obscurity, many will mourn an institution which helped Bitcoin into the limelight, but the Bitcoin ecosystem itself will benefit from the jettisoning of a non-functioning component. AnonymousMarch 1, 2014 at 5:47 PM This is the "death" noted by the pluto transit (conjunt sun). Now comes the rebirth. Watch BTC get stronger than ever post GOX. ReplyDelete Replies astrolibertarianMarch 1, 2014 at 10:13 PM I'm mostly with you: I bought on the Gox-related dips. But I'm not ruling out the possibility of more "death" when the Pluto transit goes exact to the Bitcoin Sun or is triggered by a faster-moving planet forming an aspect.